Summary: This book shows how two friends, Lily and Salma, become closer because they make the effort to get to know each other better. Differences between people can be opportunities to learn and celebrate new experiences. Lily and Salma not only learn about each other, they also invite the whole class to join in a festive lunch gathering that embraces diversity. 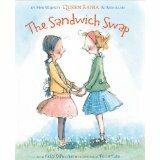 Literary Elements at work in the Story: The 3rd-person omniscient point-of-view lets the reader know what Lily and Salma each think about the other’s sandwich and that each feels sorry for the other having to eat such a yucky lunch! This narration contributes a summarized beginning, “It all began with a peanut butter and jelly sandwich” and ending, “and that’s how it all ended with a hummus and pita sandwich” which communicates a confident authorial tone. Some of the diction like “EW. Yuck” and “EW. Gross” will appeal to younger children as a realistic way of reacting to food they do not want to eat. The last illustration is a large, colorful fold-out picture of the class lunch, emphasizing the importance of this closing fellowship meal. How does the perspective on gender/race/culture/economic/ability make a difference to the story? The perspective of this story emphasizes how similar the children are in physical make-up and how their differences in background, culture, taste, etc. make for a vibrant and interesting school. For instance, at lunch, one child eats a carrot, one has a pita sandwich, one eats a salad with a fork, and one eats a bowl of something with her hands cupped. Some of the children are shown with braids, or hair scarves, pony tails, curly or straight hair. Variations in the children’s skin tones are barely discernible. The last picture shows different country flags, from all over the world, as place setting/table decorations. Theological conversation partners: God has made us all in God’s image, and the differences between us in our lifestyles and cultures are wonderful opportunities to learn and celebrate. Learning and embracing change is a Christian practice that helps us be open to joyfully participate in Christ’s living presence in the world. 1. What do Lily and Salma have a fight about? How do they make-up again? How does Lily and Salma’s fight affect the whole class? Describe the things you see on the table on the last fold-out page. What are they children doing? Who in your class at school might you learn something from? How are your classmates different from each other? The Sandwich Swap by Storypath is licensed under a Creative Commons Attribution-NonCommercial 4.0 International License.